With saturation like this, we decided to investigate the $60 billion beauty industry and see what digital trends were driving these high numbers of engagement. 81% of consumers research online before making a purchasing decision. Consumer’s are becoming far more invested at every stage of the purchasing process. With access to such diverse product offerings online, consumers are spending the time to research cosmetics through vlogs, online tutorials and forums. Consumer’s are seeking to eliminate any risk pre-purchase, and want to know how to use a product and what it will look like on before committing to a sale. This increase in pre-purchase interest has led to the inclusion of video tutorials of/by brands online, to allow consumers to get a feel for the look and application of a product before putting it into their carts. This video of one of Australia’s most influential beauty bloggers, Chloe Morello, features her using Make Up Store Australia’s (MUSA) products. MUSA shared this video on their Facebook page, resulting in a 34.09% Engagement Rate, taking out the number #6 spot in the Top 10 Most Engaging Retail Posts for the month of November 2016. The increase in step-by-step makeup tutorials and the endorsement of products being used, has led to a movement of amateur makeup artists. These tutorials, by both brands and respected beauty influencers, has created the belief that professional quality makeup looks are ascertainable without formal training or paying to go to a professional makeup artist. 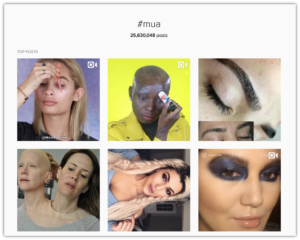 This movement is only exemplified with over 25 million uses of the #mua hashtag on Instagram alone. These amateur makeup artists are now engaging in 2-way dialogue with both brands and influencers, using social channels to demand more product knowledge, driving these higher levels of interaction and engagement we have been seeing. Not only this, but these amateur makeup artists are using social channels as digital portfolios to showcase their artistry, often tagging and hashtagging the used brands to their own personal followings, further increasing the buzz surrounding the industry online. 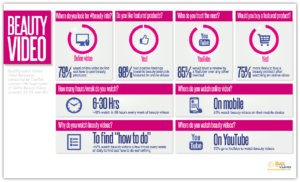 85% of beauty consumers say that they would trust a cosmetic review by a YouTuber over any other method. With statistics like these, it is no wonder brands such as MAC, Estee Lauder, Make Up Store Australia and many others have engaged with influential beauty YouTuber’s such as Lauren Curtis and Chloe Morello. With consumers watching anywhere between 6-30 hours of these YouTube tutorials, their ability to influence and reach large audiences is undeniable. Not only this, but consumers have expressed the ease in which they feel they can communicate with influencers due to their perceived accessibility. Another reason we have seen an increase in engagement with beauty brands online, is their willingness to participate in competition posts. As we’ve touched on before, competition posts are traditionally successful in creating high levels of engagement due to their like-to-win, share-to-win and comment-to-win entry mechanics.